Snowflake (left) and Sven (right) have been living at the St. Catharines Museum while they look for their humans. If you follow us on Twitter, you may have heard that the St. Catharines Museum has recently begun to foster two adorable toy animals, Snowflake (on the left) and Sven. Our priority is to reunite these two with their humans, but, in the meantime, we thought they might like to get to know the museum a little more. First, we brought Snowflake and Sven on a tour through our galleries. 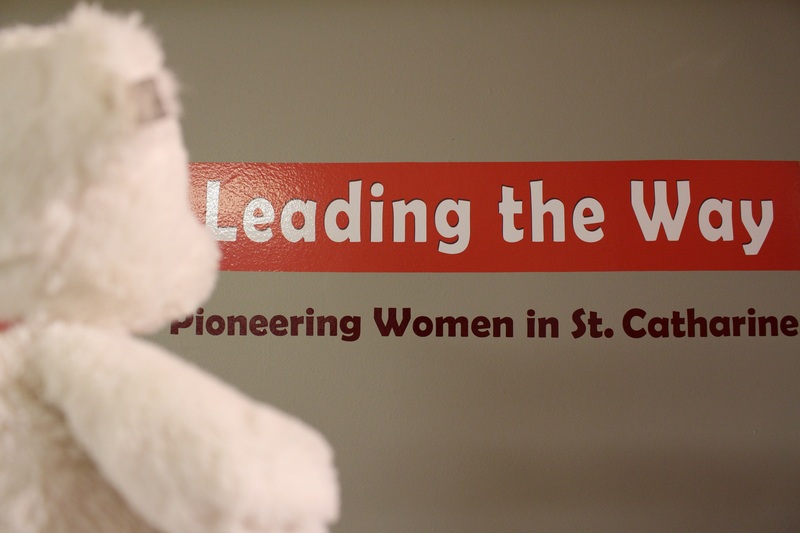 Snowflake learned all about the inspiring women who contributed to St. Catharines history in our Leading the Way exhibit. After exploring our Down to Earth exhibit, Sven realized his calling to be a farmer. Cows seem friendly enough. 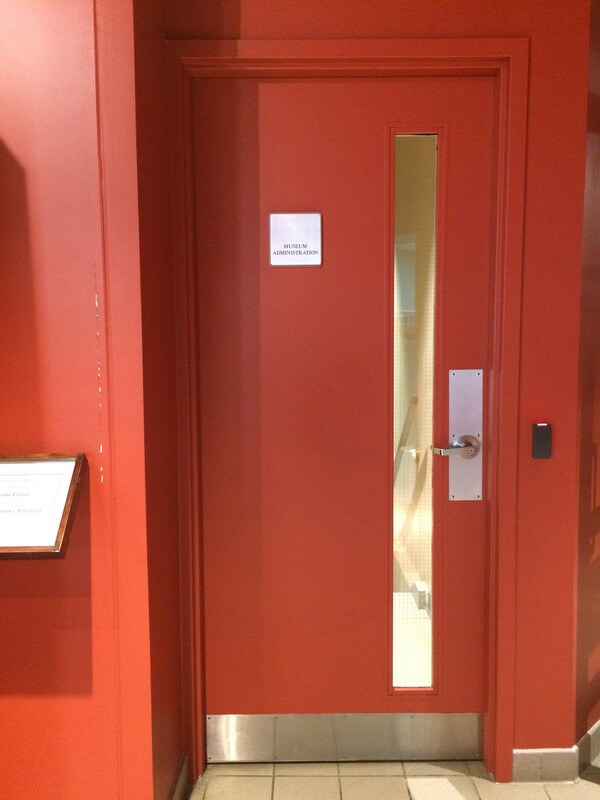 Have you noticed this door at the museum? Who’s wondered where this door goes to? Not many museum visitors think about what’s in the basement of a museum. Snowflake and Sven admit that they hadn’t. At the St. Catharines Museum, our basement is where the most exciting and intriguing of our behind-the-scenes works happens. It is where we care for and store our collection. Did you know that the museum has over 800,000 objects in our collection? Because of St. Catharines’ unique history, these objects range from maps & blue prints to marine equipment, from textiles to industrial equipment, from a portrait of William Hamilton Merritt to a Cold War-era air raid siren that was once located on the Welland Canal. You get the idea. The museum has a whole team of staff, summer students, and dedicated volunteers who work with the museum’s collection every day. 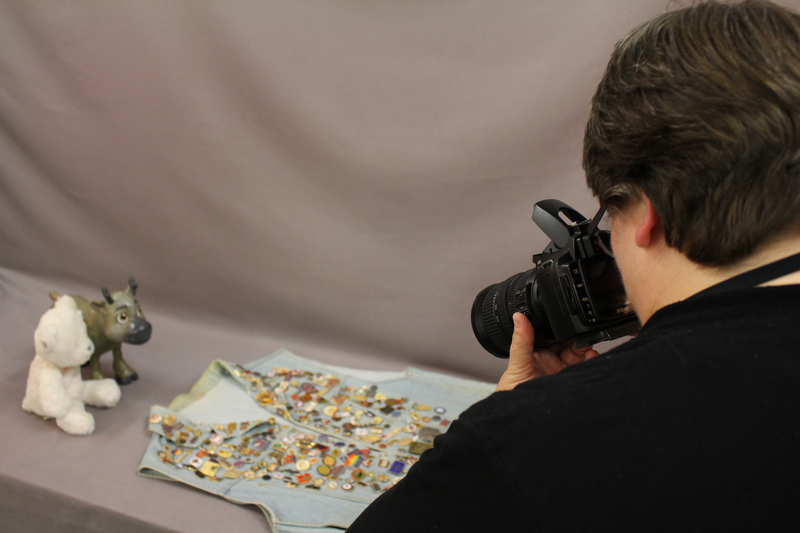 They all work behind-the-scenes cataloguing, researching, photographing, digitizing, preserving, and caring for the artifacts and archives housed at the St. Catharines Museum! Over the next few weeks, Snowflake and Sven will take you on a very special behind-the-scenes tour to learn more about what goes on in the museum’s basement, and the super cool work being done by our Collections Technicians. First up on our tour is Candace, the St. Catharines Museum’s Collections Technician- Digital. Candace cares for the museum’s Audio-Visual Collection. As you can imagine, our Audio visual collection consists of many media formats including phonograph records, wax cylinders, reel to reel audio, cassette tapes, CDs; 16mm film, 8mm film, VHS tapes, Beta tapes, Hi-8 tapes, DVDs, and digital files. Some of Candace’s favourite in the collection include a digital audio file recorded in 2009 of a 1893 waltz titled “Garden City Waltzes”, composed St. Catharines resident S. Max Walkinshaw being performed by The Cottonwood Brass Band. We also have a 16mm film titled “A Day on the NS&T” which was recorded over a period of time and shows some of the trains, streetcars, and automobiles moving through Niagara in the 1940s. Another great film was the one showing the 1948 Soap Box Derby races in St. Catharines. We’re so lucky to have such great footage of our past. 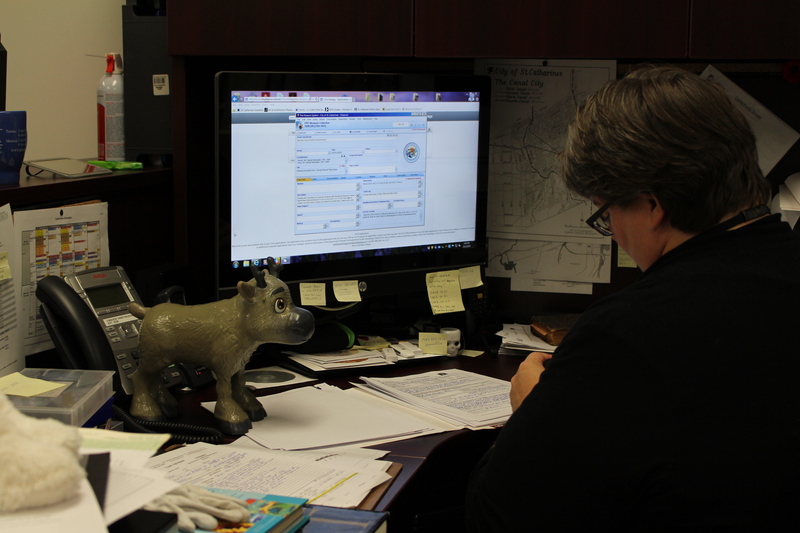 Sven trying to distract Candace with silly faces while she worked on data entry. What a jokester! Candace is also responsible for the enormous job of digitizing the museum’s collection. This includes photographing and scanning the objects as well as entering all the data documented for each object into the museum’s database, TMS (the Museum System). As of November 1st of this year, Candace and her team of volunteers made 16,937 new entries into the database. Let’s repeat that number: 16,397! This number is already extremely impressive, but it’s even more impressive when we think about what’s involved in each data entry. The TMS database is made up of a whole web of connections between the objects in the museum collection and the people, places, and event that make up St. Catharines’ history. If we were to look up a specific object in the database, the significant people and places connected to that object would also come up. The database also connects objects to other objects. This is what helps us understand the relevance of the objects in our collection. It’s up to Candace to make those connections and to establish that relevance. Luckily, according to Candace, that’s her favourite part of her job! To her, the museum collection is like a treasure chest. There are so many interesting and exciting stories attached to the objects in our collection, but these stories can only be uncovered with digging. One example of this is a recent project Candace and Sara, a Public Programmer at the Museum, worked on together. 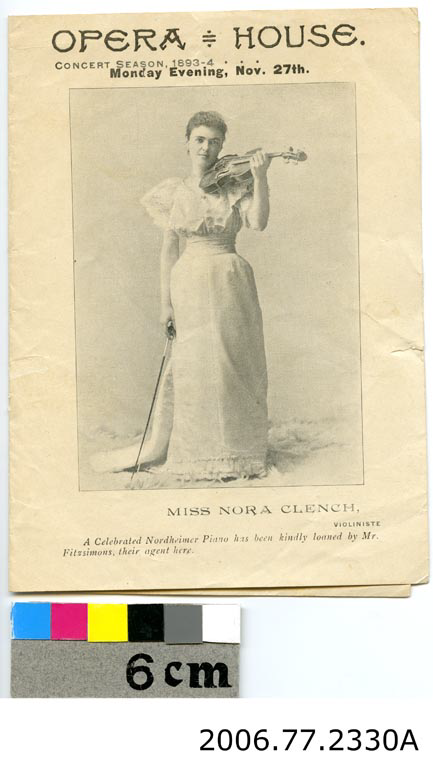 Sara was researching for a one-night only exhibition on arts and culture in Victorian St. Catharines and came across this 1893 programme for the Grand Opera House and the name, Nora Clench. After doing some digging, Candace discovered that Nora Clench was an internationally renowned violinist born in St. Mary’s, Ontario. It turns out that Nora, who once performed for Queen Victoria, also had close familial ties in St. Catharines. Nora’s great grandfather, Ralfe Clench was a United Empire Loyalist who came to St. Catharines following the American Revolution and fought with the Butler’s Rangers during the War of 1812. Nora had cousins here when she came to perform at the Grand Opera House in 1893, one of the few stops on her Canadian tour. Candace is constantly uncovering enriching stories like these in St. Catharines’ history. A great reminder that our understanding of history is always changing and evolving. Next week, Snowflake and Sven get a sneak peek of some of the museum’s most fascinating artifacts! Stay tuned. Sara Nixon is a Public Programmer at the St. Catharines Museum and Welland Canals Centre. Sara thanks Candace for her help in writing this piece and for putting up with Snowflake and Sven’s shenangians.